What happened when one of my clients tried to land planes at an airport with two control towers. Yikes! In the John Maxwell Thought Leader Segment, I’m gonna share one of my favorite laws of leadership, The Law of Process. Tom: What if there were two air traffic controllers at the airport? And imagine being a pilot, hearing, “Alpha-Mike-Echo, Four-Five-Two-Three, you are clear to land.” And responding, “Clear to land, Roger,” only to hear something like this. Tom: If one controller told you it was okay to land, but another controller told you no, it wasn’t okay to land, when would you ever feel like it was safe to land? When it comes to air traffic control, you simply have to know who’s in charge. Voiceover: Becoming a Geek Leader. Season Three, Episode Five. Tom: This episode is sponsored by Brighthill Group’s Professional Speaking Services. Are you a member of a professional association? Is your regional state or national group planning their upcoming annual meeting? I can help you planners with keynotes and workshops on topics like communication, leadership, delegation, planning, or conflict resolution. Also, is your company planning an “all-hands” meeting? I can help your leaders plan a productive and memorable event. I can professionally facilitate your meeting, and deliver content that is completely aligned with your goals. Here’s what Erin Kwon said after having me speak for her statewide association. Erin: I really enjoyed working with Tom because he is practical and down to earth. He brings really good content. He’s very engaging as a speaker, and I think the audience really connects with him. They not only get the content but they also get an entertaining presentation. So I would definitely recommend working with him. I will certainly call him in the future for any events that I have. Tom: Check out BrighthillGroup.com/Speaking, that’s BrighthillGroup.com/Speaking, for testimonials, videos of me on stage, information about my most popular topics, and more. Welcome back to work! I hope your time away was great, and now you’re rested and ready to jump into some powerful stuff. In today’s episode, I want to share with you what happened when one of my clients tried to land planes at an airport with two control towers. Yikes! I’ll also talk about the elements of building a great team, recruiting the right players. And in the Jon Maxwell Thought Leader Segment, I’m gonna share one of my favorite laws of leadership, The Law of Process. Let’s get started. Jon: Hello, I’m Jon Maxwell, and as one of my founding partners, Tom has been trained by me and my team. Tom: The Law of Process is something you can start to apply when you’re at Level One of the Four Levels of Thinking as a Geek Leader. But you’ll continue to apply it for the rest of your career. Voiceover: Level One, Individual. At Level One, you may even be a superstar technical resource. Level One focuses you on improving your technical skills. Tom: In our continuing series from Jon Maxwell, I wanna share Law Number Three from Jon Maxwell’s book “The 21 Irrefutable Laws of Leadership.” Now, Law Number Three is the Law of Process. The Law of Process says that leadership develops daily, but not in a day. Leadership develops daily, but not in a day. Simply put, what it means is you can’t become brilliant at leading other people overnight. But you can get better, and it requires that you make the right choices every day. Let me give you an example. I had a client who worked in a bank. He wanted to get promoted, but he only had experience in one area of bank operations. If he wanted to move ahead, he would need to find a way to learn new things. So what did he do? He went to the commercial loan department, and he asked if he could take a look at all the new loans as they were approved. Now, this was a process he began to follow to help him get equipped to understand what a good loan looked like. Now, following this process, he became smarter about his business, and that helped him professionally. When the opportunity presented itself for him to be able to step into a role as a loan officer, he had a lot more information than he would have had before. I’ll give you another example that Jon Maxwell shares, about the story of Theodore Roosevelt. Jon’s story goes like this. In the United States, President Roosevelt is remembered as a man of action. While in the White House, he was known for boxing, Judo, and horseback riding. Earlier in his life, he was a cowboy in the Wild West. He was an explorer, a big game hunter, and a cavalry officer in the Spanish-American War. He was a man of great intellect, a deep thinker, and a visionary. He created the National Park System because of his belief that we would need to protect natural habitats. He was a Renaissance Man, for sure, but he wasn’t always rough and tough. He grew up in a prominent wealthy family in Manhattan. As a child, he was puny and sickly, had asthma, bad eyesight, and was weak. His father told him, “You have the mind, but not the body. Without the help of the body, the mind will never go as far as it should. You must make the body.” Roosevelt began spending time every day building his body and his mind. Lifting weights, horseback riding, ice-skating, boxing, and more, combined with reading, study, and learning from good leaders around him. This daily, diligent preparation opened doors for him that would not have otherwise been opened to him. The Panama Canal, the Park System, the negotiation of peace between Japan and Russia, and under his leadership the U.S. emerged as a world power. Teddy Roosevelt lived the Law of Process, and you can too. When we decide to move forward, when we decide that we want to grow, we have to put a process in place that’s gonna help us, just like Roosevelt did with his lifting weights and activities that he was involved in. Another leader, Jim Rohn, said that success is a few good choices repeated daily. He also said that failure is a few bad choices repeated daily. Now the fact is, that’s true for you and it’s true for me. What are you hoping to accomplish? What are you planning? And then what process can you use to support yourself as you move toward your goal of growth? Maybe you need to create a template or a checklist. I use those all the time when I’m preparing these podcasts and the other things that I put together, the emails that I send out. Maybe it’s a change to the way you operate. When I decided I wanted to eat healthier, and I know my willpower is low at night, I was a lot more successful when we simply didn’t have ice cream in the house. So the way I applied the Law of Process to healthier eating was I didn’t buy ice cream when I went grocery shopping. I want to encourage you to think about what it’s gonna take for you to achieve what you wanna reach next. Maybe it’s a plan or a schedule to help you prepare for what’s next. And if you need help with some planning, the bonus episode I just put out last week is a great resource to help you get a jump-start on your new year. I use systems and processes all the time. I probably overthink some of my processes, but the fact is that I find that those processes become tools that I can use to make it easier to execute each time. Here’s a rule of thumb: If you find yourself doing something a third time, it’s likely a good candidate for you to take the time to create a system or a process to support you. The Law of Process teaches us that leadership develops daily, but not in a day. What process can you apply to help grow your leadership in the next six months? And that’s today’s Jon Maxwell Thought Leader Segment. Tom: In our Mentoring Segment today, I wanna tell you a story. And in this segment, we’re talking about collaboration. And the skills you need are skills you can use at Level Two of the Four Levels of Thinking as a Geek Leader. Voiceover: Level Two, Team Member. Level Two is where you work well with others, and together you all succeed. Now, from our description so far, things look pretty bad for the vendor, right? Inconsistent releases, poorly tested code, a very angry client… I mean, what kind of bozos are these people anyway? Well, when I was brought on board, rather than start with that conclusion, I decided to become intensely curious about the vendor’s perspective. I interviewed numerous onsite and offshore team members from the vendor to see if I could understand what was happening from their side. I sat down with members of my client’s team to inquire with them about their perspective, to figure out what was happening. Now, as you might imagine, the vendor’s point of view was significantly different from my client’s point of view. They found themselves absolutely baffled by the unpredictability of my client. They didn’t understand why the client was so upset. Over time, they had increasingly committed more and more resources to try to make the customer happy, but it just wasn’t working. As I continued in this assessment process, I discovered one significant thing that may have been the root cause of all of the problems. The significant thing I discovered was there was a different set of expectations on the part of my vendor and the part of my client. My client expected that the vendor would deliver the features they requested in the order they requested them. Now, what they hadn’t counted on was the fact that this vendor was selling this product internationally, and they had been for a long time before my client entered the picture. The vendor had a mature product management and software development lifecycle in place. But each party, the vendor and my client, believed that they were the product owner, they were the decision-maker, and they were the priority-setter for the new features coming to market. Now, this is a little bit like having an airport with two control towers. All over the world right now, air traffic controllers are making decisions about what’s gonna happen next, and they tell the pilots what to do, and the pilot’s job is to follow the commands of the air traffic controllers, period. 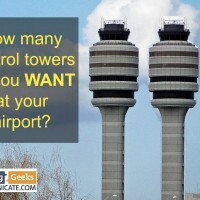 Now, imagine an airport that has two control towers. Two air traffic controllers, each of whom believes they have the authority to make the decision about plane altitude, plane direction, runways, take-offs, and landings. What if there were two air traffic controllers at the airport? And imagine being a pilot, hearing, “Alpha-Mike-Echo, Four-Five-Two-Three, you are clear to land,” and responding, “Clear to land, Roger,” only to hear something like this. Tom: If one controller told you it was okay to land, but another controller told you no, it wasn’t okay to land, when would you ever feel like it was safe to land? When it comes to air traffic control, you simply have to know who’s in charge. And in my work with clients, I see over and over again, in big projects and in small ones, there’s just not a clear answer to who’s in charge of what. Now it seems like it’s a pretty simple thing to solve, but it turns out that unless you’re really, really careful and intentional about it, you can screw that up. And it even happens at my house! There are times that my wife and I have to pause in the middle of a frustrating time or conversation, maybe even a heated conversation, to say, “Whose project is this?” And in fact, it would have been a huge help to my client and the vendor if they had spent the time to clarify who’s gonna do which thing, and by when. In this case, I think they actually both failed to communicate. Neither one clarified roles and responsibilities. Each of them acted as if they were in charge, and each of them got mad when they were frustrated by the experience they had as a result. Now, this was compounded because this particular client was fairly new to a software development process, and their process was actually pretty immature. And they weren’t using any sort of project management methodology at all. And when it came to their feature request process, it was inconsistent at best. Now, it’d be easy to point fingers at the client, and certainly the vendor did, but the vendor blew it, too, because if they had been more transparent about their product management process and how they set priorities and how they approved code that went into production releases… If they’d been clear that they weren’t forking the code base for my client, but my client’s bugs and features requests were added to all of their other clients’ bug reports and feature requests. If they had documented their development process and improved their communication with the client, everybody would have been a lot happier. At least, they would have been less unhappy. So, to wrap up, I think the key question when you’re preparing to take on a major project… You have to understand who owns what. Who gets to make the decisions, and how conflicts will be resolved. It’s really important to ask the question, “Whose project is this?” And that’s today’s Mentoring Segment. Tom: Today’s email is on the topic of how to hire great team members, and this is something you’re gonna do when you’re a manager or Level Three of the Four Levels of Thinking as a Geek Leader. But, even if you’re not a manager, you can play a strong role in improving hiring for your team even if you’ve just started in your first job. Voiceover: Level Three, Team Leader. Level Three. As the boss of a team, your job is to recruit and develop individuals and team members who follow your lead. Jeb, I wish I had one single thing that would magically fix it, a silver bullet that would make all your hiring problems go away. The fact is, there are lots of layers to this issue, but I think I can offer a couple of ideas that may help point you in the right direction. The reality is that most of the time, we are crazy busy when we have an open position. Maybe we’ve been overworked for a long time before management agrees to let us add a new team member, or maybe we’ve been overworked for a long time because somebody left and we’re shorthanded. Not only that, but we’ve had little training on how to recruit or how to hire. We’re buried, and then we complain to HR that we need to get them moving on the process. And what is the first thing they ask us for? HR says, “Give me a job description.” So, what do we do? We go find an old job description, we make a few changes. Now the thing is, standards are good, but usually we end up with job requirements based on edits from the last time we hired. And those requirements may bear little resemblance to what we actually need. What’s worse, the job requirements are almost exclusively focused on technical skills. Can the person do the technical work that needs to be done? Here’s the big problem with that: Stanford Research International found that 87% of success in our work comes from people knowledge and 13% comes from technical skill. So if I can get just a little math nerdy for a second, we can say that our ideal candidate probably only has 65% of the skills we’d love for somebody to have, because we know that a lot of time a job description is more of a wish list than it is a requirements list. And so let’s say a candidate comes in with 65% of the things that we want in our ideal technical skills for our candidate. Well, if they’ve got 65% of the 13% of success that comes from technical skills, that means their chance of being successful is 65% of 13%. No wonder we have trouble finding good candidates! And here’s what we know: When somebody doesn’t have the right people skills, we say things like, “They just don’t get it,” or, “Well, they’re not a fit.” Or maybe we say, “They’re not a team player,” or, “They’re just weird,” and that weirdness plays out in a thousand little ways. They might not work at the right pace. They might not work at the right quality level, and when it comes to quality, quality too high or too low is a problem. Not only that, but we can’t articulate what it is that would make somebody a good fit or not. And we’re really kind of flying blind when it comes to the part of the job that makes up almost 90% of their success! Now, ideally, you’d have a good baseline of assessments that show you the key characteristics that good team members have. And those key characteristics are different by role. So you would have good data about the skills that make you a great QA person. But the thing is, the skills that make you a great QA person or an auditor would be terrible skills for a salesperson, and vice versa. So in the absence of solid, statistically significant, relevant data by role, what can you do? Well, I’ve got a few suggestions. First, spend some time to define what actual skills the team member needs. Now, I’m not talking about “College Degree in X” or “eight years of related experience.” I’m thinking about the specific types of roles or experiences you want them to have. What are the skills and contributions you really need? And I’ll tell you, it’s easy, but it’s a bit of a cop-out to expect that somebody’s gonna come in the door with direct experience on every platform and every version of everything you already support. Even still, if they come in with all the technical knowledge, they’re not gonna know all the nuances of your business. Whoever comes in the door is gonna need to come up to speed on the stuff you’re working on, so you want to focus not so much on the technical skills as you do on the soft skills. I want you to think about looking at this opening as an opportunity to make your team better. When you think about the overall team, what are the areas you’d like to see be even stronger? And when you put your list of skills together, put those gaps that your team currently has first on the list of the skills that you’re looking for. This is an opportunity for you to transform your team with greater and better skills. What you wanna do is find the best person for the team. They may not be strong in the same areas where your team is already strong, but you can make your team better by finding somebody who’s strong in areas where the rest of the team isn’t strong. So think about what actual skills your team member needs. Now, second, think about what makes your team a good team today. Spend some time to think about stories you can tell where your team performed well or maybe where a team member did something exceptional. I call these “hero stories,” and hero stories help you put into words the things that make your team unique or special. These are the things that represent your actual values. And they’re the things you want to look for in a candidate. Making the time to come up with a few stories, a few hero stories, is a good way for you to prepare for a behavioral interview with a prospective team member. You can ask them to, “Tell me about a time when you had to…” and listen to see if their approach, their values, their pace, their quality, and more match your team’s expectations that are already in place. So think about what makes your team a good team today. Next, think outside the box. Rather than look for somebody who already has the exact title you’re looking for, consider people who have maybe less experience or different experience. Consider people who would be making a lateral transfer in from another department or another discipline. The social science studies are very clear. Diverse teams come up with better solutions. So I want you to look for somebody who doesn’t look or think or act like the rest of the team. Now, it’s true that diverse teams take longer to gel and longer to come up to speed, but when they’re running well, they outperform teams who have similar education, training, and experience. So you wanna think outside the box. Next, think beyond technical qualifications. Remember that most success comes from people knowledge. What kind of people skills should they have? And then, how can you tell? How will you know when you see those skills? The smaller the team is, the more important each hire becomes to the team’s overall success. Make the time to hire slowly. If you’re really clear about the skills you’re looking for, it makes it a lot easier for everybody throughout the entire process. Also, always be on the lookout for great people. I remember when I was leading a team, we didn’t have any openings, but I made a point of keeping my eyes open and building relationship with people that I thought would be a fantastic addition to my team. And I would go to them and tell them, “Look, I don’t have any positions open right now, but when the time comes, I would love to have you on my team.” Now, for some of these people, I’ve stayed in touch with them every couple of months for a year or longer. But I was able to recruit and build strong teams because I found the right candidates when I met them. And also, instead of relying on HR to source your candidates, why don’t you use your network? Think about somebody you respect. Once you know the kind of skills and capabilities that you’re looking for, the types of cultural expectations you have, go talk to people you know. Start asking everybody you know if they know anybody like this. And tell them what you’ve discovered, and ask them to keep you in mind and to make a connection for you. Now most of the time they’re not gonna know anybody, they’re not gonna have anything for you. But here’s the crazy thing, over time, they will think of you when they come across somebody who’s like that. And then they’ll call you up and say, “Hey I just met somebody you ought to meet.” You’d be amazed at how the people you know make connections for you. And really, what do you have to lose? Now, each of these suggestions could be a separate podcast on their own, and I know I’ve just barely scratched the surface. But the key idea is for you to set aside time to develop a clear picture of exactly what you’re looking for in your team members. Once you have that picture, it’s going to be much easier for you to know a great candidate when you see one. And that’s today’s Coach’s Mailbox. Tom: In today’s episode I talked about what happens when you try to land planes at an airport with two control towers, and what happens when you don’t have clarity about who’s actually in charge of the project. We also spent some time talking through how to recruit the right players for your team, and I introduced you to the Law of Process. For today’s Episode Hack, I want to go back to the Law of Process because I think that once you have a good process, you can use that to grow your skills in lots of different areas. So, right now, I want you to make a decision about some growth you’d like to achieve. Maybe you want to communicate more clearly, or maybe you want to have better leadership skills. What if you decided right now on a process? Maybe it’s, “I’m gonna read one book a month or take one online course a month,” on that topic. Now, some of you might be thinking, “One a month? What are you, nuts? I don’t have that kind of time!” Okay, maybe one a quarter. But the idea is that you’re gonna commit to a process that’s gonna give you the skills that you need. Making a plan about what you’re gonna think about and work on for the next several months is a great first step to applying the Law of Process to your success. And that’s today’s Episode Hack. If you liked the podcast, can I ask you to give me a hand? It turns out, it’s a big deal to have a rating in iTunes. Now, I’ve heard other podcasters asking for ratings and reviews, and I wondered why they kept going after it again and again and again. Do you want to know? Because almost no one actually does it! It only takes a minute, and it’s a huge help. So why is that? Great ratings help iTunes decide that this podcast is worth promoting. And when you put a rating or a review, it helps it appear as a top podcast in the iTunes search. Could you please take a moment to do it right now? There are three simple steps: One, go to the iTunes Store Podcasts. Two, search for Becoming a Geek Leader. And three, give the podcast a great rating. Thanks!